Whip out this cleverly minimal opener whenever guests call for wine or beer. We think easy entertaining is about having the right tools for the job. Keep this cleverly minimal opener handy whenever the occasion calls for wine or beer (in other words, always). 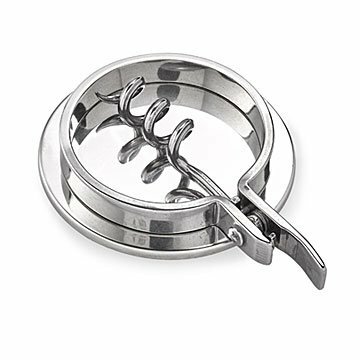 Unfold the corkscrew from its elegant loop of stainless steel to uncork your favorite Malbec, and keep the IPA flowing with the bottle opener built into the hinge. Between bottles, you can stick it to a fridge magnet or keep it on the bar neatly parked on its magnetic dock (with a scratch-free bottom). Paired with a favorite bottle, it makes a great hostess gift for any wine or beer lover. Made in China. I bought this wine opener because it does not have a knife on it so we can carry it in our carryon when we travel. It's perfect!